– Vos sabés que en política pasa de todo. – La Justicia no podrá devolverle la vida al Fiscal Alberto Nisman. Pero podrá devolvernos la dignidad a todos los argentinos si se atreve, como él se atrevió, a ir en busca de la verdad. Justice can’t bring prosecutor Alberto Nisman back to life. But it can bring back dignity to all Argentines if it dares, like he did, to go in search of the truth. January. Monday. Around 7 a.m. I woke up and went to brush my teeth. That is not the perfect line to start a review. I know, nothing poetic about picturing people brushing their teeth. But that is how everything started for me. When I got out of the bathroom, my mother was already up. She always tries to be up to say “take care, have a good day at work” (like that ever happens, but it is nice to have someone to tell you those things, anyway). I still don’t know if I was suppose to go to work that day, because I remember I stayed all morning watching the news. And now I see an image I tweeted that Monday at 8.43 a.m. So, no, I did not go to work. And if my previous boss is reading this, now he knows the truth. The most relevant homicide in Argentina’s recent criminal history was there. I had to know. I was not going anywhere. So, like I said, I went back to my room and watched the news on my computer. I don’t have a t.v. in my room–good habit–, but I can’t go out before checking the news, the weather and other trivia. However, there was nothing of trivia in the news I was about to watch. Argentine federal prosecutor, Alberto Nisman, was found dead in his apartment. I could not believe it. I remained in silence for a couple of minutes. Stunned. A mix of confusion and powerlessness took over me. When, how, WHO. Why? Not why. I could sense the reason. That man was the chief investigator of the 1994 car bombing of AMIA (Israelite Argentine Mutual Association), the Jewish center in Buenos Aires, where 85 people were killed and about 300 injured. That man accused President Cristina Fernández de Kirchner, his Foreign Minister Héctor Timerman (of Jewish religion, may I add) and other politicians of helping Iran to cover up the consequences of Argentina’s worst terrorist attack. That man, on that Monday, was about to present his allegations to Congress. But that man had been killed hours ago, silencing the investigation forever. Condemning him and other 85 souls to oblivion. Making “justice” a simple word you can only find in the dictionary. After a while, I came back to reality and went to my mother’s bedroom to tell her. The reaction was the same. She could not believe it. Con esto, me juego la vida. That is how I found out about the murder of Nisman. And that is how Suicidado starts: with the retelling of how G. M. Bracesco found out. Social media is a powerful thing. We know everything in real time. So, when journalist Damián Pachter tweeted, on January, 18, at precisely 11.35 p.m., that something was wrong in Nisman’s apartment, the impact was reasonably tremendous. As he explains in the book, Bracesco himself was the first journalist that went to Puerto Madero to investigate and record everything that was going on. With that impressive amount of information, he created this work. Nonetheless, he warns us that his book constitutes a personal hypothesis. Usually, the line that divides reality from fiction is ridiculously thin. And, according to Mark Twain, “The only difference between reality and fiction is that fiction needs to be credible”. In Argentina, reality has lost every possible credibility, so a book about our last twenty years of history, wouldn’t be logical, at all. Again, the writer states that this is his hypothesis. It is defined as kind of a crime novel. And no one can affirm that this series of unfortunate events did not occur exactly the way the author explained us. Bracesco’s writing is very straightforward. The lack of pretentiousness in language is something that I always celebrate. It is not a simplistic writing style that underestimate the reader, but his colloquial use of the language helps you to easily connect with him. And, in the middle of such harsh descriptions, he made room for some funny remarks concerning certain characters and situations. The structure of the book is simple and coherent. It contains short and engaging chapters with the author’s explanations and descriptions and also fragments of news, interviews and records that support his words. There are some mistakes (editor, hello), maybe the rush of getting this book out on the streets, but everything I could ignore (okay, I still underlined with my pencil every one of those because I am a neurotic reader; I have a problem and I am aware of it so don’t judge me!) because of the revolting feeling in all organs of my body due to every dreadful detail that portrayed human degradation at its finest. A wave of sorrow and anger took over me and by the time I finished the book, I was immersed in a sea of uncertainty and hopelessness. I am Argentine. I should be used to that by now, right? And still, I should not get so used to it, for that leads to political and social anesthesia. A state of mind that many politicians long for. We certainly can’t allow that. Se busca por una cuestión política, borrar una causa de un crimen de lesa humanidad. …how the murder of Nisman was possibly perpetrated and the events that followed (an exiled journalist, frightened witnesses, media manipulation by the ruling party, Lagomarsino’s story, a President answering through Facebook), with a special part regarding how the experts that were supposed to preserve the scene, did all the contrary. Negligence or determination. Stupidity or obedience. Coffee, croissants and sandals over blood. El encubrimiento siempre tiene cara de incompetencia e ineptitud. The desperation to cover up all the loose ends can make you fatally sloppy. The special prosecutor of this case is Viviana Fein, who, during that fatal night, asked journalists for prudence, patience and said that in the course of a few days they would know the real cause of death. Hoy no tengo pruebas, pero tampoco tengo dudas. In conclusion, a prosecutor was killed the day before he could present his allegations to Congress after a ten-year investigation. Something that would have shaken our Government completely. We do not know much, but we do know that nothing in politics happens by mistake nor by accident. Everything has its reason. Everything can be planned. And we are always in the middle of their personal interests. Politics, business, media, powerful companies. They can always understand each other. We are the ones always in the middle. Watching. Waiting. Waiting for the punch, for the adjustment, for the legal consequences only reserved to us, like a never-ending tribute to the Kafkaesque universe. Alberto Nisman is another wound in this chain of corruption, money and power that so well defines Argentine history. We should never forget. Books like this one are necessary to prevent us from forgetting. A shocking book; a necessary reading. Because in oblivion lies impunity. 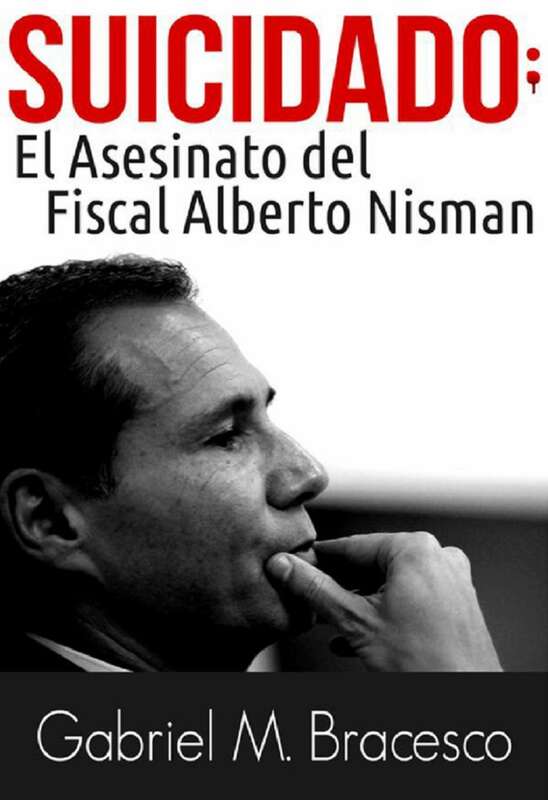 This is a thrilling story… until you realize that the death of prosecutor Nisman is not fiction. Today is July, 17. I am writing this review as we commemorate the 21st anniversary of AMIA bombing. The following is a 1947 poem by the eclectic Dylan Thomas, that Bracesco included in his book. With this, I finish.